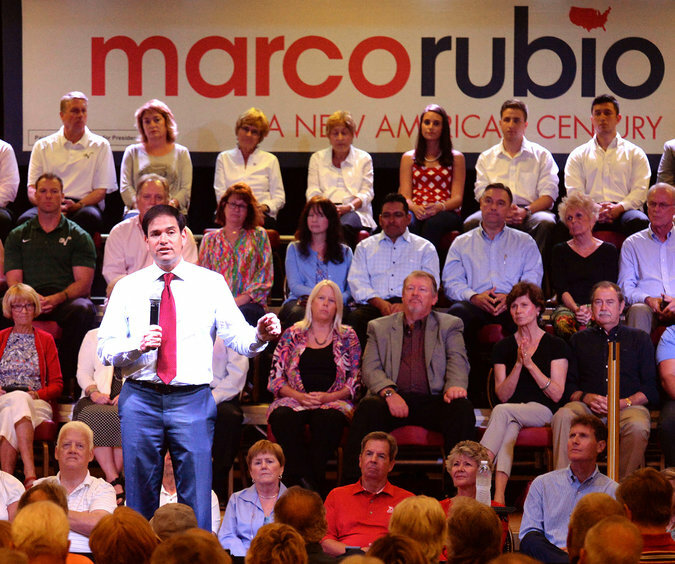 Marco Rubio on Monday afternoon at Eisenhower Recreation Center. The hundreds who turned out Monday afternoon for a rally for Marco Rubio, have high hopes for the energetic White House candidate. Villagers Ed and Helene Ziegler came very early and got front row seats. “I knew we were going to like what he said,” Helene said. “He’s a breath of fresh air,” her husband, Ed, added. The junior senator from Florida bounded to the stage at Eisenhower Recreation Center, running about an hour late. The youthful looking 44, Rubio has an impressive record of public service spanning over 15 years. He is a University of Florida graduate with a J.D. from the Miami School of Law awarded in the late 1990s. He is married to the former Jeanette Dousdebes, and has four children. His parents came to the United States seeking economic freedom from a Cuba ruled by dictator Fulgencio Batista in 1956, three years before Fidel Castro rose to power. Duval residents Steve Juntunen and Lynette Rauscher, plus Helen and Bill Moll, from Mira Mesa Village, enjoyed Rubio’s platform. Thomas and Cindy Young, from Lady Lake, liked what they heard. “He brings adult conversation back into the room. We have had 8 years of not having grown ups in government,” Thomas Young said. Village of Mira Mesa resident Helen Moll said she wanted to take Rubio home. Her husband, Bill Moll, was equally impressed. “He is just what this country needs,” he said.